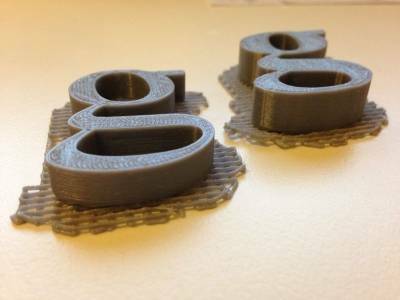 Not surprisingly, what we ended up with was a nice smooth letter 'G' from the inventor model and a faceted 'G' from Sketchup. Happy that the faceting was not related to the printer or our slicing software the next step was to find an alternative free modeller and test it using our newly created 'G-Test'. I've actually had FreeCAD installed on my machine for some time but apart from a cursory look never got into it. Faced with the challenge of the G-Test I decided that it was time to get to grips with it. Freecad is not the easiest program to use. Whilst it appears to be feature packed and seems to be very capable I had a lot of trouble getting my head around creating even basic models without resorting to online help. Being a software engineer and writing a lot of GUIs I can usually find my way around most programs with no issue but Free cad was an unusual exception to this rule. I think that most of this simply stemmed from the fact that there were too many different operating modes and toolsets. The ironic thing is that this is probably a feature to make the software easier to use. Usability issues aside, possibly the worst thing that I found with Freecad was that it simply kept crashing. it took me ages to perform a simple change to my model as every time that I tried it crashed. This did not give a very pleasant user experience at all. The other issue that I found with Freecad was that I could not figure out how to insert true type fonts into the model. This meant that our awesomely devised G-test had to be replaced with something that would work on all 3D CAD packages. 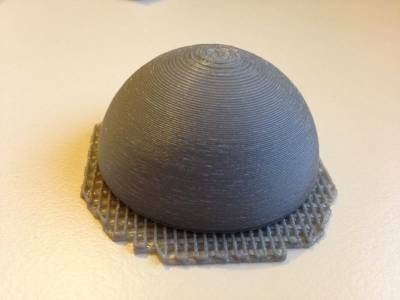 In the end we decided that a simple hemispherical shape 50mm in diameter would be a good enough test of both the rendering and STL output capabilities. Incidentally it was trying to chop a sphere in half to create the 50mm test model that caused Freecad to bomb out. 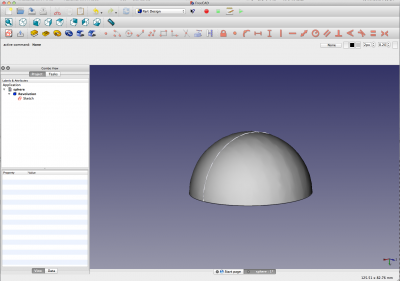 The odd thing is that unlike the faceting I had seen in Sketchup, Freecad exhibited an almost mottled appearance. This was visible in both the rendering in the program and also in Replicator-G. The print itself also showed signs of this. 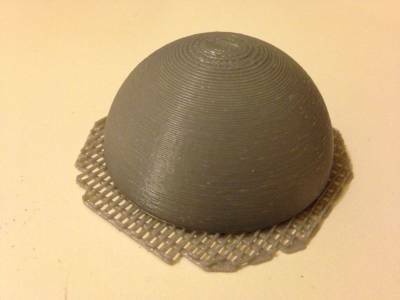 Having changed the G-Test to use a 50mm hemisphere I had to reprint my test model. Whilst all of the other programs tested here include spheres as a basic shape Sketchup does not. this means that you have to create one using the 'follow' command. This is not something that is easily figured out so a quick tutorial might be of assistance if like me you could not quite get the follow command to work correctly. One great thing about Sketchup is that it's pretty simple to use and very robust. No frills, and a bit artificial looking but a hemisphere none the less. So far there is not really much to tell. Exporting the model to an STL file requires a plugin. This plugin can be downloaded from the sketchup extensions warehouse website. Originally written by third party contributors it is now supported by Sketchup themselves. 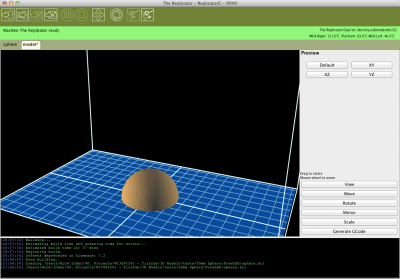 The interface to 123D Design is very slick and feels a lot smoother to use than Sketchup. There are many features and styling queues that are obviously inspired by Inventor which is a very good thing. Using 123D Design is fairly straightforward if you are already used to using something like Sketchup so it did not take me too long to figure out how the create a basic model. The 'Primitives' menu is a nice feature - this allows you to insert common geometric shapes such as cubes and cylinders which makes it much faster to create things. 123D Design also comes with some commands that you will not find in Sketchup - namely sweep, revolve and loft. Whilst similar results can be obtained with the 'follow' command in Sketchup the inclusion of these commands is a real game changer for anyone looking for a free 3D modeller as they open up a lot more possibilities. The resultant model is clearly the smoothest of the three models created. This is easily visible when viewing the STL file in Replicator-G. 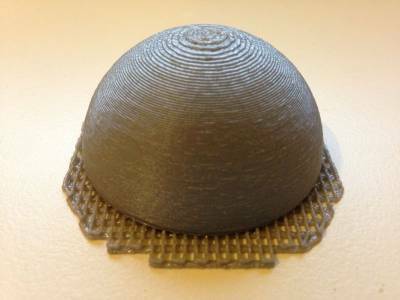 The printed part is also the same, much smoother and noticeably less surface undulations than the Freecad part. Here's a side by side shot of all three next to each other. Left to right we have Sketchup, Freecad and finally 123D Design. Clearly there is a massive difference with the the Autodesk product, but what about comparing it with the professional packages? 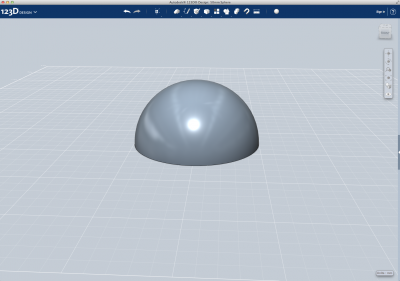 To give our results some kind of grounding I asked Phil to create a 50mm sphere in Inventor. I also asked Phil to export it using the default STL settings as unlike the programs we have been testing it is possible to tweak the resolution of the STL output file. The printed part is almost indistinguishable from the 123D design part. It's only really on closer scrutiny that you can discern any difference. Here's all of the parts side by side for a comparison. Left to right the parts are: Sketchup, Freecad, 123D Design and Inventor. Looking at the results is easy to know what program I will be using from now on. Autodesk have clearly entered into the 3D printing arena with a bang. Whilst the 123D Design program may look like a toy, and bundling it up with the other apps in the 123D suite does nothing to help dissuade you of this, it is actually a fully fledged 3D design app. You can easily use it to create anything you want to print and whats more the output quality is right up there with it's bigger brother. I mentioned earlier that 123D Design is actually part of a suit of programs. This suite also includes apps to create monsters, turn 2D images into 3D models and even a really cool app called 123D Catch. This is a mobile / tablet / online app that allows you to use your normal camera to take multiple images of a subject that are then magically turned into 3D models that you can download and print on your 3D printer. Whats more is that all of these apps are available on multiple platforms and devices and are all joined together by on online premium cloud service that allows you to share models between your devices and friends. It's obvious that Autodesk are playing hardball in the 3D printing stakes and it would not surprise me if they came out on top. Inventor is the defacto standard for 3D modelling and it stands to reason that they have both the funding and knowledge to make a serious play in the emergent 3D printing field. Sketchup might be the easiest to get to grips with but 123D Design is really not that much harder to use. 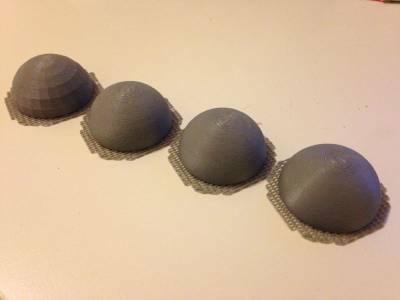 I would definitely recommending putting the extra effort into learning 123D Design, especially if you actually plan to print any of your models. The 123D Design iPad app is also a consideration for those who might want to design on-the-go. The iPad app is almost identical to the desktop version except that it does not appear to allow you to enter dimensional data for your models. 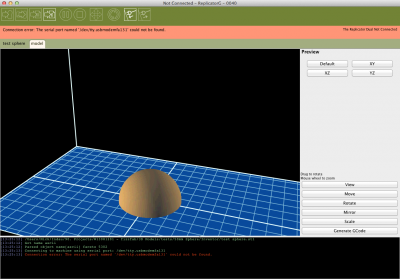 With competition like 123D Design, Freecad is simply not worth the bother. It's complex, buggy and to be fair is probably aimed at power users and larger multi-component designs. I would say that it has more in common with inventor than Sketchup. The STL quality is good, and if you are already familiar with Freecad there is no reason not to use it ,but the learning curve for new users and the ease of use that the competition has simply rules it out. 123D Design gets the two thumbs up from me.